While it is hard to believe it’s been 10 years since we met Pattinson, Lautner and Stewart as their beloved characters, there are certainly plenty of fans still out there to warrant a celebration of this important anniversary. Human beings seem to be fascinated by anything supernatural. Werewolves, ghosts, and vampires are often the subject of stories in books, on television and in movies. In 2005 author Stephenie Meyer threw her hat in the ring with her young adult novel Twilight. The book was a best seller, which spawned 3 more books in the series and a total of five films. The saga became a sensation and made stars of its three lead actors – Robert Pattinson (Harry Potter and the Goblet of Fire), Taylor Lautner (Abduction) and Kristen Stewart (Snow White and the Huntsman). As we celebrate the 10th anniversary of the first film (coming out in 4K this week) we are also treated to the other four movies rereleased on Blu-ray. In New Moon, the second installment in the five-part movie saga, Bella's (Stewart) heart is broken as the Cullens leave Forks in Edward's (Pattinson) misguided attempt to keep her safe. Bella, trying to keep Edward close, finds new and more dangerous ways to seek thrills while simultaneously strengthening her friendship with Jacob (Lautner). Bella also learns there are other supernatural beings besides vampires and that Jacob is one of them. Movie three, Eclipse, has Edward returning as he and Bella prepare to marry much to Jacob's disappointment. However, another vampire creates an army of newly minted baby vampires in an attempt to avenge her lover's death, which was caused by the Cullens. This development causes the Cullen vampires to form a tenuous alliance with the werewolves in an attempt to protect Bella. Breaking Dawn parts I and II, see the culmination of the series and breaks the final book into two parts. In Part I, Bella and Edward marry and she becomes pregnant with a half vampire/half human baby. The entity growing inside her though is killing Bella and plans are made to do whatever necessary to save her life, including turning her into a vampire which Jacob strongly opposes. In Part two Bella wakes as a vampire but is aware there are other, ancient vampires, the Vultori, who threaten her daughter, as making a young vampire is strictly forbidden. The Vampires and Werewolves must fight together to save Bella and Edward's daughter since this ancient clan wants to kill her. The final showdown takes place in a large field but ends without bloodshed. In the end, Alice (Ashley Green; Rogue) shows Edwards a glimpse of the future where he and Bella stand with their grown daughter and Jacob who is charged with protecting her. Each Blu-ray comes with a special cover that is colorful and makes for a nice, little "collector's" series. The 1080p video quality is terrific and offers so much in the way of vibrant colors and wonderful details such as the fur on the werewolves. The CGI in these films is very well done and the Blu-rays show them off nicely. The DTS-HD Master Audio 7.1 is excellent though not as dynamic or intricate as the Dolby Atmos of the 4K version of the original Twilight film. Each combo pack is full of extras for fans to enjoy. While most are previously released, there are literally hours upon hours of footage and features to be reviewed and dissected. The Twilight saga created a frenzy when the books first came out and it continued and grew with the feature films. While it is hard to believe it's been 10 years since we met Pattinson, Lautner and Stewart as their beloved characters, there are certainly plenty of fans still out there to warrant a celebration of this important anniversary. If you are a fan, you will want to buy all of the films. If you have a fan in your life these are a great holiday gift idea. Buy them before they are gone! Download The Twilight Saga: Extended Edition from the iTunes Store in Digial HD. 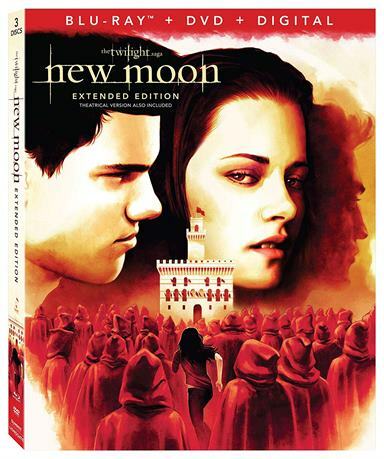 For more information about The Twilight Saga: New Moon visit the FlickDirect Movie Database.